I realized I forgot to review Crimson Peak. Well, technically I didn’t because I’m reviewing it right now. It’s not a difficult film to forget, which seemed to be the consensus at the box office. Guillermo del Toro is like Hollywood’s ghost. Some have heard of him, few have ever seen him (his films) and even fewer believe. I believe. Few filmmakers are around today, making the kinds of stylish fantasy films with the amount of passion and detail as del Toro. Few filmmakers have as much fun. This is the man who made Pacific Rim, a $190 million excuse for a grown man to play with toys. Who wouldn’t want to play along? Yet soulless, boring movies like Transformers: Continental Drift are the “films” people see. Why does mainstream America avoid del Toro like the bubonic plague? Are his films too weird? Too gross? Not enough single dads with hot daughters? Maybe everyone is scared. No one likes to say they believe in ghosts, and yet many of us believe. Crimson Peak is a gothic period piece about lost spirits and oozing mansions. Mia Wasikowska is Edith Cushing, an aspiring novelist with a ghost story (the ghost is a metaphor) living in 1887 Buffalo with her tycoon father Carter (Jim Beaver). Haunted by the skeleton monster spirit of her dead mother, Edith has spent her whole life being told to “Beware Crimson Peak.” Good to know. She’ll never go to a spooky sounding place like that, right? Wait, what was the name of the movie? Edith’s life takes a turn when English baronet Sir Thomas Sharpe (Tom Hiddleston) comes to America with a business proposal for Edith’s father. Thomas plans to mine the red clay underneath his decaying family estate Allerdale Hall to sell for building resources but is shut down for being a slimy British guy. Edith, on the other hand, is smitten with Thomas. She can share her stories with him, have conversations with him, and even love him (if you catch my meaning.) They fall for each other and in no time become the new IT couple. Let’s call them “Thedith.” Thomas moves Edith back to Allerdale Hall with his creepy twin sister, Lucille (Jessica Chastain), but not before Edith’s father is murdered. Don’t worry, Sons of Anarchy guy (Charlie Hunnam) is on the case. Not to mention Edith has more important things to worry about at Allerdale Hall, like skeleton ghosts. 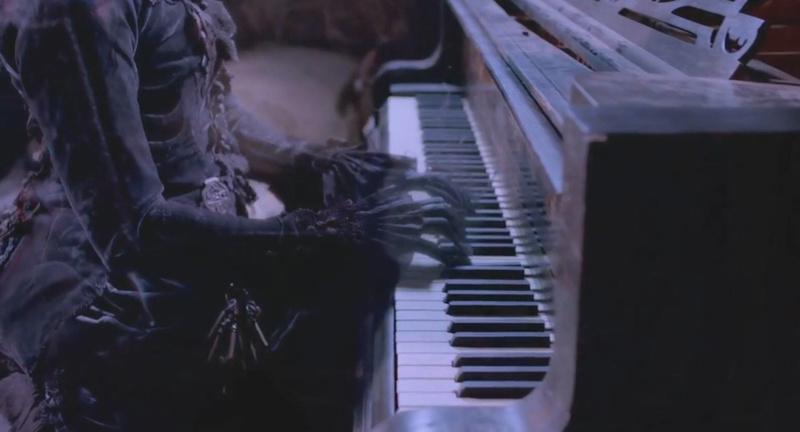 Crimson Peak plays out like a much better episode of Dark Shadows. I’ve also heard the comparison in style and presentation to the English horror films produced by Hammer Studios in the late 50s and early 60s. Both feel appropriate. There’s a dreary mood, hoity-toity characters with a lot of history, but with more ghouls and goblins. Visually, the film is a sensory overload. Allerdale Hall is a sight to see with its cracked ceilings and vast empty hallways. Unlike most horror films, Crimson Peak also uses a significant amount of color. There are less blues and grays and more reds and yellows. Most notably, there’s the snow outside Allerdale Hall, which turns blood red in the winter. This is how Allerdale Hall ended up with the nickname “Crimson Peak.” OH NO! That was like, the one place she wasn’t supposed to go! No wonder it’s SO HAUNTED there! Here on out, Edith can’t find a moment of peace, swarmed by skeletal figures, most of who I assume are Doug Jones, roaming the halls and telling her to leave. There’s also talk of a murder most foul. It’s more than enough to keep the audience enticed, and it’s a sight to see as the ghosts, much like the costumes and sets, are the mark of quality and craftsmanship. I only wish I could say the same about the story. From what I have gathered, Crimson Peak was one of the many projects del Toro proposed to studios but was the only one to get greenlit. It makes sense now. I’m sure del Toro did genuinely want to make this film, but it clearly wasn’t his first choice. I know he’s wanted to adapt H.P. Lovecraft’s At the Mountains of Madness for years. He’s also been unable to make sequels to both Pacific Rim and Hellboy 2. Thus, Crimson Peak would have to suffice. Of course, del Toro is always going to put detail and artistic flair into anything he does, he’s an artist, but I get the feeling his heart wasn’t in this one as much. This was more of a film he thought would be a neat idea, not a passion project. The film is beautiful, the monsters are scary, but the story feels like a placeholder for a better idea. As a del Toro fan, I’ll take what I can get, but I hope he gets more of an opportunity to express himself freely in the coming years. All of us deserve a good haunting from one of the finest fantasy directors of this or any era.